My Knitting Olympics strategy unfolded like this. 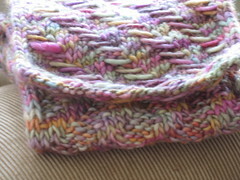 I am such a flutterby when it comes to projects, that I hated to try and determine a specific project the I would feel like knitting a few months later. After all if I really loved the project, wouldn't I want to knit it right now? So, I picked the shawl relay because I figured that I could accomplish it in the allotted time, and could reasonably guarantee that I would be willing to knit a large rectangle with some sort of pattern. I also signed up for WIP Wrestling because I knew the likelihood was that I would need a little something else to distract me, so I thought if I made it part of my schedule that would cut down on the guilt. So, I was all set. I cast on and knit four rows during the opening ceremonies of the Woodland Shawl, before returning to the scarf. 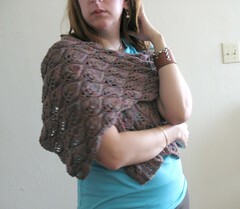 I worked on the shawl much of the weekend and was making great progress. In fact I was starting to think it might be finished really soon. And hey, I might even have time to finish up a second WIP or something, since the scarf was going well too. And then, Wednesday night, after the yarn traveled to knit night, tragedy struck. No more shawl. I - just - oh, it was terrible. I continued working on the scarf and finished that up Friday. And I finished. So, phew! I found a pattern today for my San Francisco artfibres yarn. 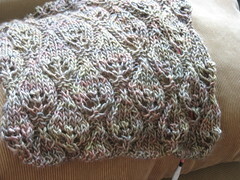 That scarf pattern I'd wanted to use just won't work, but there's enough yarn to make a big comfy sweater.